Are you looking to transform your custom outdoor patio into an intimate space for you and guests? Balancing function with style can be challenging with so many ideas and options available today, that is why we have put together some helpful tips and tricks that will give you the outdoor space that fits your lifestyle and enhances the appearance of your custom outdoor patio. A patio without plants is like a kool-aid without sugar, bread without butter, one without the other is just not as enjoyable. At Affordable Shade Patio Covers, we want you to get the most out of your patio. Adding life to your outdoor space in the form of plants will enhance the aesthetics and invite relaxation if done correctly while softening the hardscape qualities of your patio. There are many ways to add greenery and color to your covered outside space, but we have found the easiest way to integrate plants without breaking the bank is the use of pots and containers. Container gardens are portable and easy to maintain with many different colors and style options available to fit your needs. Additionally, potted plants make it easy to move inside in the event a freeze happens in Houston (yes, we know – a freeze is a rare event!). Additionally, if placed in the right areas, plants can help establish parameters and pathways along your custom outdoor patio. If the goal is shade, the height of the tree selection when it is fully matured is essential. Choosing a tree that grows too tall, may cause problems with your patio cover if not trimmed consistently. All trees have roots, but some trees have root systems that are more aggressive than others. Those with root systems that branch out far may disturb your patio foundation in future years. Trees that are evergreen and are easy to maintain are your best bet for your patio. After all, you want to enjoy your outdoor space, not have to clean up leaves and branches from an overburdensome tree continually. It is best to talk to your local nursery about the best kinds of trees for a patio. But, here are a few of our favorite; Japanese Maple and Sunburst Honey Locust. In cultures all around the globe, water has been linked to relaxation. So, it only natural that water feature options be considered when landscaping your custom outdoor patio. Decorative garden fountains come in all shapes and sizes, from small to elaborate. You can purchase different designs and styles from home improvement stores and nurseries or try your skill at a DIY project. Either way, incorporating a water element into your custom outdoor patio is sure to be a crowd pleaser. If you are currently looking for patio builders in your area to make your outdoor dreams come true, you might be wondering how to pick the right contractor for the project. Having apprehension when choosing a contractor is common (we have all heard horror stories) it doesn’t have to be a daunting task. Here are a few things you want to do when choosing patio builders (or any other contractor that you might need for that matter) before having them get to work on your construction or remodeling project. A little research on a particular contractor before hiring them can go a long way toward being sure they are the right one before you sign a contract. Make sure to read customer reviews from multiple sources whenever possible. One thing to make a note of when doing this is to pay attention to how the contractor responded to any negative reviews (if they reacted publicly, many do respond but not for all to see). The main thing you need to do is look at an overall ratio of the number of reviews combined with the ratings they received. For example, patio builders who have a 4.3-star rating and have more than 30 reviews is a good ratio, whereas a company that has a 3.7-star rating and only has eight reviews might be one you want to avoid. A legible and legal warranty on all work performed should always be standard, and any contractor worth working with should not only present you with one before you sign an agreement but be able to answer any questions about it. A contractor who offers a vague warranty contract or one who trips and stumbles over trying to explain terms or answers regarding their warranty is almost always one you want to avoid! Likewise, asking the contractor for a minimum of 5 local references and contacting them about their experience is an excellent way to avoid the nightmare of having someone rip you off. Make your desire to have everything in writing known early on, and tell the contractor what your expectations are upfront regarding material costs, labor costs, the estimated time the project will take, and any other details you want in writing. One significant thing to add to any signed agreement like this is to make sure the contractor knows they must inform you of any changes or additions to what is agreed upon as the project begins. This step can save you from extra charges and possible litigation fees down the road. While having patio builders ask you for money to purchase materials before beginning a construction project is very common, you should be concerned if they ask you to pay for any labor costs before work begins. One way to ensure that everything is on the up and up is to ask for copies of all material receipts. This small and simple request can ensure that everything the contract states is being followed, protecting you from inflated costs and keeping everyone honest from start to finish. Heavy rains, high winds, hail, and other calamities are a reasonably regular occurrence here in the Houston area, and they can all leave your home’s exterior worse for wear. To say nothing of hurricanes and the aftermath they leave behind! While you will need a professional craftsman and an insurance adjuster to inspect your property so any damage found can be covered by your insurance company, it never hurts to do at least a cursory inspection yourself. It is essential to inspect all of the roof surfaces of your property, including any backyard patio cover, attached garage, and any other outbuildings. Here are a few tips on how to perform your damage inspection after your area has been hit by inclement weather. Wind damage can leave cracked windows, lifted roof shingles, damaged tree limbs that can pose a fall hazard, and many other problems in its wake. Make sure you carefully inspect the shingles on your home’s roof for signs of damage, as well your backyard patio cover and other areas likely to be impacted by the high winds. You also want to make sure to take a look at your home’s siding, exterior AC/Heating units, windows, and any fencing on your property for signs of damage from winds or the debris they can carry with them. Hail damage accounts for hundreds of millions of dollars in insurance claim roof work each year, but you don’t have to be an adjuster to spot it if you know what to look for. Hail damage on a roof can be detected by searching across multiple planes of a roof for places where the composite material on your shingles has been knocked off partially. Typically you will find the plane of a roof facing the direction the weather passed overhead from to be more affected by hail than other areas, so look at weather reports before climbing the ladder to get an idea of where to start your inspection. When the integrity of a roof is compromised by wind or hail damage, you can be sure that you will have a leaky roof at some point. The apparent signs of a roof leak, whether it is on the main roof of your home, your backyard patio cover, or other area need little explanation. Water spots on ceilings, actual dripping water, or the appearance of the scent of mold all speak for themselves! Inspecting the insulation of your attic, particularly where beams meet at any point, is an excellent way to spot any trouble areas before they soak through and become much more expensive to repair or replace. Finding a local roofing company to perform an inspection of the roof of your home, backyard patio cover, attached garage, and other roofed areas is not hard; one of the methods we suggest is to contact your insurance company for a list of preferred providers they work with. As always, we strongly advise you to check references, read multiple reviews, and get multiple quotes before moving ahead when you are in need of repairs. As the old year ends and the new one begins many homeowners start thinking about the warmer months ahead. Outdoor birthday parties and other occasions, backyard barbecues with friends and family, and splashing in the pool to cool off after a long day of summer fun are just a few of the things that come to mind for those dreaming of what is to come! Here are a few things to think about when remodeling your existing patio or, if you don’t have one yet, to consider when designing your outdoor palace! Whether replacing one that is weather-worn or having one installed for the first time; you have quite a few options when it comes to patio covers in Houston. Pergolas are patio covers that offer a stylish look to any outdoor venue. These patio covers are typically made of wood and are ideal for outdoor entertaining that lets the sunlight in a while offering a great visual aesthetic. For a more private and enclosed setting consider a patio cover that you can enclose with a screen to keep the mosquitoes at bay while allowing you to relax outside with close friends and good food! Take a look at our website for more examples of patio covers! Statues, outdoor fountains, stone benches, pathway stones or tiles: these are just a few of the accents you can bring to an existing patio design (or include into a new construction project) to add further elements of style and appeal to your home’s exterior. Stone and concrete elements can be purchased in a wide variety of colors and textures to match any design theme or color scheme. If you have a sample of concrete or stonework already present, you can share it with a supplier to have them find a match or create one when it comes to pathway stones, tiles, and other items. Including a row of evergreens to enclose your patio from view, blooming seasonal plants in hanging pots, or an old-world looking rack of succulents are all great ideas to bring the constructed and natural into a stunning visual harmony. There are also a number of seasonal blooming shrubs, bushes, and small trees that do well in Houston weather with a little care. Thinking about this element of your patio area is also a great time to plan other backyard landscaping projects so that everything can be done at the same time to have your place looking photo perfect! Whether you are having a patio built from the foundation up or thinking about a redesign; choosing from concrete for the flooring and other areas or deciding to have a deck built takes some serious consideration. 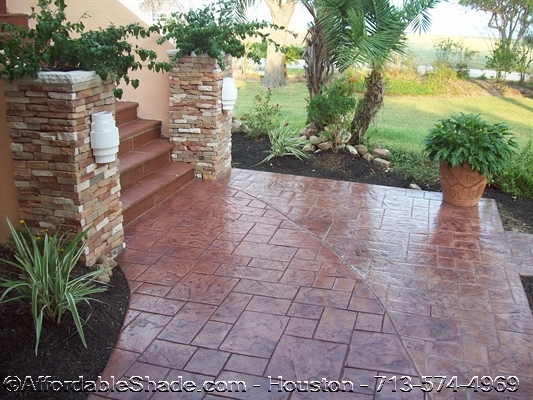 The pros of a concrete patio are long term durability (assuming proper care of course), the ability to have colored concrete poured that matches your home’s exterior color scheme, and many other benefits. The advantages of having a deck built are in the visual appeal of a rich wood finish, the sweeping and eye-catching design patterns available as well as the speed in which they are typically completed. 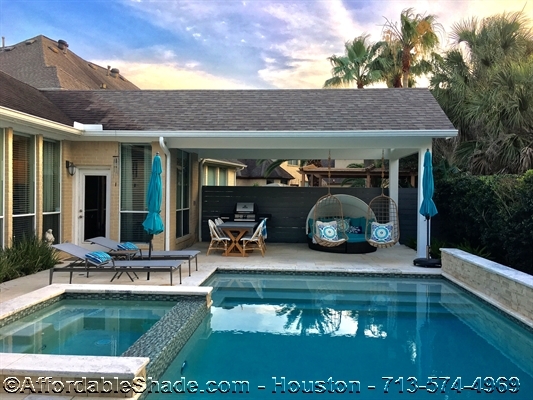 If you are considering a new outdoor addition to your home in 2019, then give Affordable Shade Patio Covers a call today. Thanksgiving is around the corner and you sure want to impress guests with some finger-licking Thanksgiving Dinner. 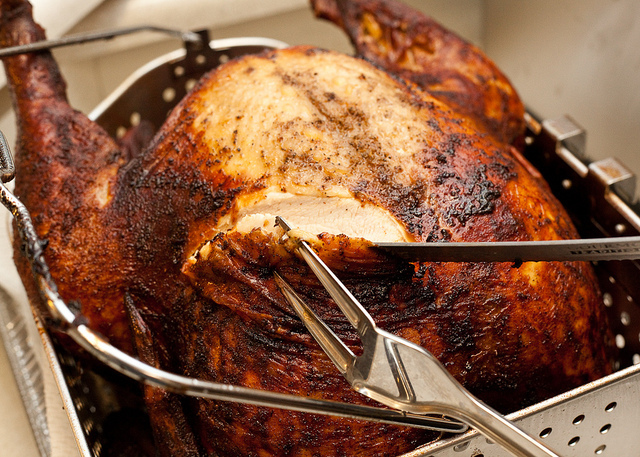 If you have done your research well, you probably are in favor of deep-fried turkey. There are safer infra-red fryers on the market, but those big enough for a turkey are hard to find. Furthermore, the crunchy texture and juicy meat of the deep-fried turkey hard to ignore. However, your safety during the frying process is not to be exchanged for anything. Not only do we outline safety procedures, but there is also some useful information on the right ingredients. 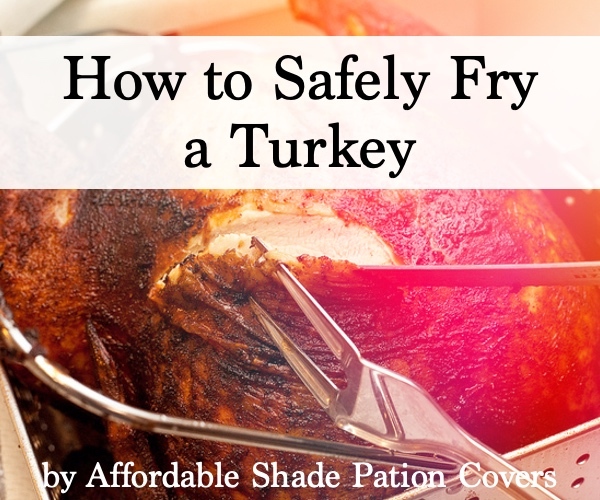 There is also a procedural guide on safely frying the turkey. Obviously, you a turkey. Next, you need some oil with a smoke point higher than 425F. Refined corn, safflower, or peanut oil will do just fine. After that, you need to determine the exact amount of oil required, as follows. That is the exact amount of oil you will need to safely deep fry your turkey. After that, you will need to dry rub and apply seasoning on your turkey. If doing it outdoors, double check you have gathered several things. You will need gloves, long-sleeved clothing, and goggles for safety. Kitchen shears help in slicing, and you might need paper towels. You will also need an oil thermometer to keep temperatures in check. A fire extinguisher also comes in handy in case a fire starts. 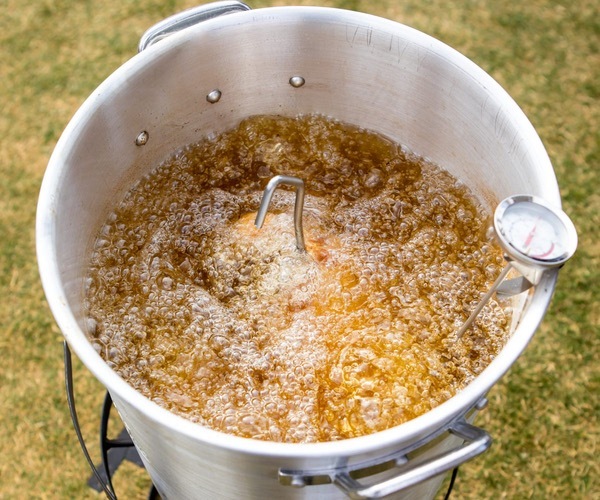 As for the turkey fryer, make sure it has a stable stand, rack, stock pot, a probe thermometer, as well as an injector for your propane tank. It is imperative that everything goes as outlined. Oil spillages and fires are an imminent risk. Thus, everything that is manageable should be taken care of. That way, only unforeseen occurrences could cause minimal issues. First, ensure your turkey is completely thawed before getting into contact with oil. Ice or sludge could lead to oil spillage. 4-5 pounds of turkey require 24 hours of thawing. 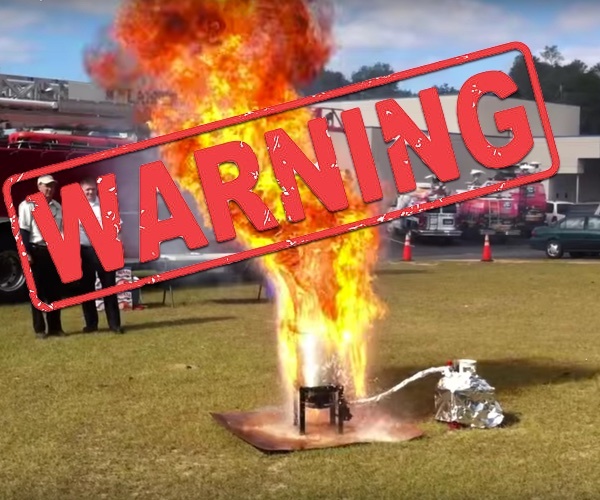 Before frying, make sure the fryer is stable, and not within reach of flammable objects. That includes garages, trees, among other farm structures like patio covers. Lastly, cautiously remove the pot from the deep fryer once through. The oil should cool down for about 12hrs before disposing of it. Now that you have the safety tips at the back of your mind let the action begin! Keep the flame low before placing your pot. Once the oil is in the pot and put on the burner, increase the burner intensity. Attach your oil thermometer to the pot’s side with thermometer’s tip submerged in the oil. Keep checking until you get to the desired levels, 325-350oF. Use paper towels to get rid of any excess moisture. Use the shears to get rid of excess fat, and slit every leg at the front. Using a marinade, dry rub, or both apply your seasoning of choice. Avoid water-based marinades. Hook your turkey to the lifter and remove the thermometer. Reduce the flame and lower the turkey slowly into the oil. It should take about a minute. For every pound, the turkey should cook for an average of 3.5 – 4 minutes. Once cooked, gradually remove the turkey from the pot letting excess oil drip off. Check the turkey’s internal temperature with the help of a probe thermometer. It should be at least 165oF. Once done, place the turkey on a pan or paper towels. After around 15-20 minutes, it should be ready for serving. This is Affordable Shade Patio Covers wishing you a safe and wonderful Thanksgiving Holiday. And enjoy lots of turkey and pumpkin pie! Do you have paint on a concrete surface and aren’t sure what to do to remove it without damaging your property? 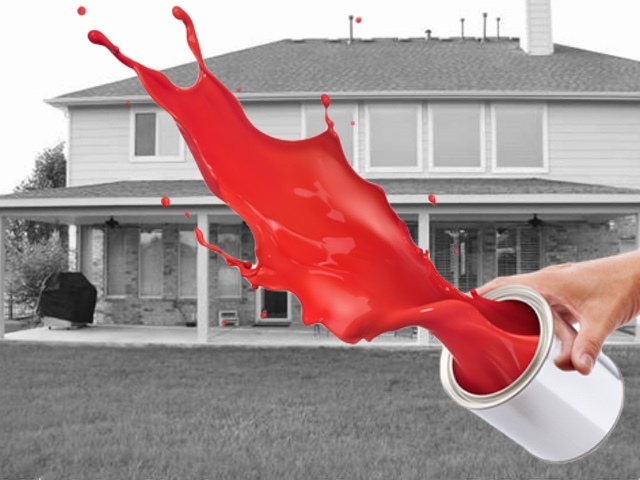 Whether you have a big mess from a recent painting project or small one from a child that went crazy with a paintbrush on your patio, now is not the time to panic! 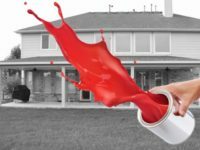 Take a few deep breaths and follow these simple instruction on how to wash the paint off of your concrete, whether you have a lot to deal with or just a few tough spots. Sweep or vacuum the area that needs to be cleaned, using a scraper or stiff brush to remove debris or loose paint as needed. Apply a paint stripper designed to remove oil-based paints to the surface area using a disposable cloth. Time to get scrubbing with a stiff bristle brush to remove the loosened paint, or if you know what you’re doing you could use a power washer for this step. Repeat the steps as needed depending on how tough/old the paint in question is to remove. Clean the surface you just worked on, making sure to remove all traces of the paint stripper from the surface. Get a few supplies together, including a methylene-chloride based paint stripper (make sure the area is well ventilated), fine ground clay (you can grind kitty litter into a powder if clay is hard to come by), a stiff brush, and scouring powder. Mix the paint stripper and the absorbent material to create a paste, taking into account that you might not need that much clay/cat litter depending on how thick the paint stripper is. Scrape off the clay/paint stripper paste, repeating as necessary to remove the paint from the area. We hope this advice helps you keep your patio cover looking clean for many years to come. 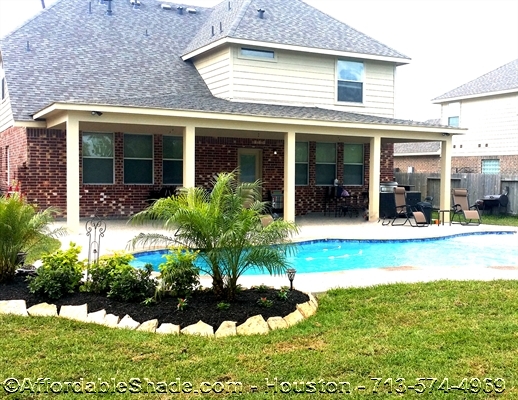 If you are in the Houston area and are thinking about building or extending your patio cover, then give Affordable Shade a call today. We provide free design consultation and written quotes to our potential customers. Our phone number is 713-574-4969.